Mrs. Claus, center, played by 15-year-old Talia DeWolfe of Gloucester, leads her elf assistants Peppermint, left, played by 10-year-old Bezzie Strong of Gloucester, and Mistletoe, played by Gabrielle Cros, also 10 and from Gloucester, during a rehearsal Monday for this year's "Holiday Delights" show featuring students from the Gloucester Stage Youth Acting Workshops. 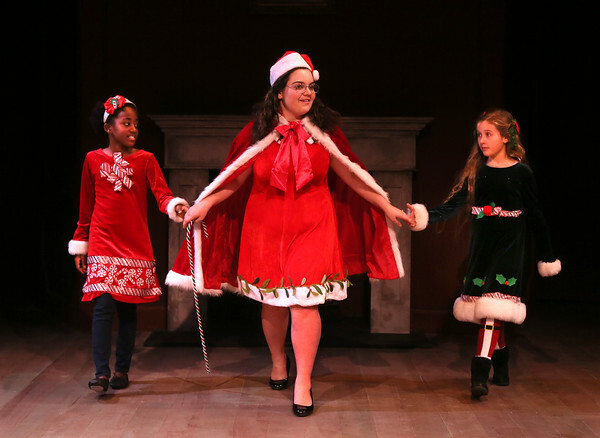 The show, featuring over 40 children ages six to 17, follows a Gloucester girl's magical journey on Christmas Eve to discover what is really important during the holiday season. The show will be presented Friday at the Gorton Theatre on Friday at 7:30 p.m. and Saturday at 2 p.m. Ticket prices are $15 for adults, $12 for senior citizens, $8 for students and $6 for children under 12.